Our customers’ interests always come first. Our experience shows that if we serve our customers well, our own success will follow. While recognising that the old way may still be the best way, we constantly strive to find a better solution to a customer’s problems. We pride ourselves on having pioneered innovations which may become standard in the industry. We select our people one by one. In a service business, we know that without the best people, we cannot be the best firm. We respect our employees and value their contributions. We are dedicated to creating a work environment that is professionally challenging and personally rewarding. We believe in teamwork, and as a team, delivering exceptional results to our clients and their customers. 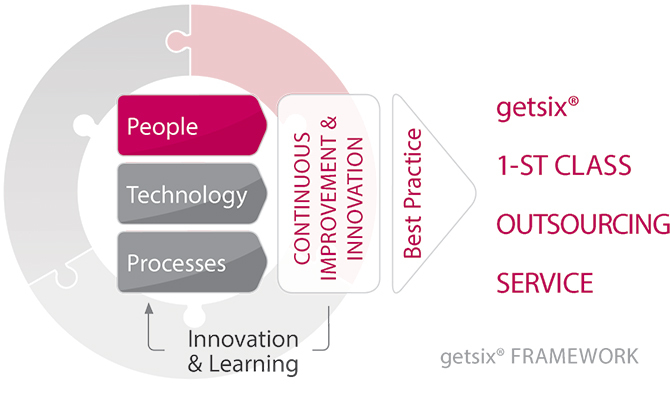 We are committed to the professional development of each person, as they progress through their career at getsix®. We constantly strive to anticipate the rapidly changing needs of our customers and to develop new services to meet those needs. We know that the world of accounting will not stand still and that complacency can lead to extinction. We regularly receive confidential information as part of our normal customer relationships. Our business is highly competitive, and we aggressively seek to expand our customer relationships. However, we must always be fair competitors and must never denigrate other firms. Integrity and honesty are at the heart of our business. We expect our people to maintain high ethical standards in everything they do, both in their work for the firm and in their personal lives.